Retaining freshness in cut vegetables, as well as retaining vitamins and nutrients, is a top priority. Also, cleaning on changeover must be fast and easy when processing different vegetables on a single machine. Brunner Anliker’s GSM MULTICUT 240 can produce up to 600 kilograms per hour of cut vegetables for meals in catering, ready-to-eat companies, salad and vegetable processing facilities, airline catering, care homes and hospitals. The ceramic reinforced cutting discs effectively produce a draw cut to prevent moisture loss and ensure that the processed food stays fresher for longer. A mobile unit, with maintenance and service-free induction motor and gear unit, it can perform fine, coarse, shaved, julienned, brunoise, match, wafer, wave and cube cuts as well as making french fries and tomato slices. 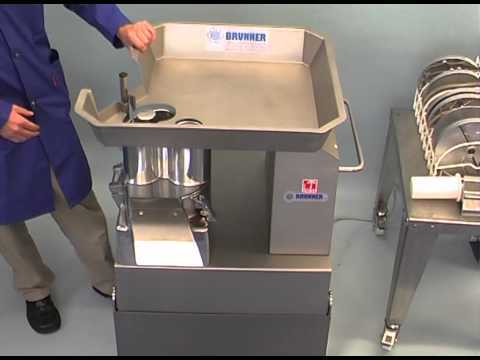 Brunner-Anliker is a leading manufacturer of machines for cutting, chopping, grating, grinding and declumping foodstuffs. Brunner Anliker is a leading manufacturer of Swiss made kitchen appliances and high quality cutting equipment.